After 8 hours or so in transit from Cairns to Osaka, my boyfriend Liam and I were tired, but mainly hungry, when we finally arrived in Japan. I have this crazy fear of using airplane toilets so I refuse to eat (and sometimes drink) on flights. Yup I’m weird. So we decided to visit the vibrant food precinct of Dōtonburi. 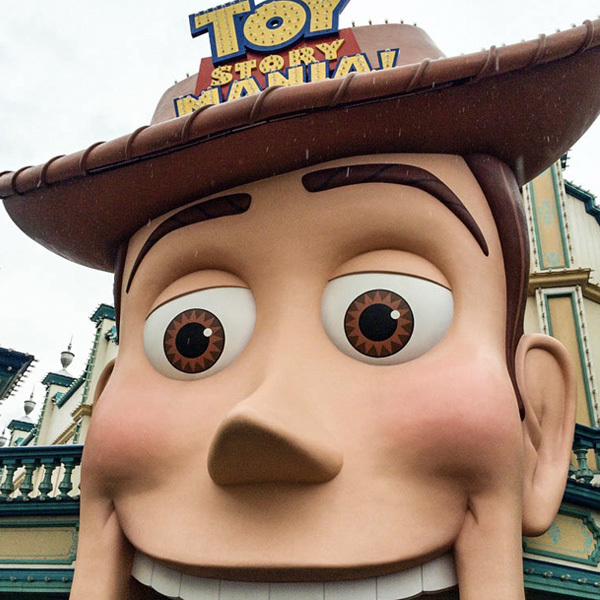 I have visited Dōtonburi many times, but it was Liam’s first time here. Located in Namba, this place is hands down the best place to sample all of the amazing local Ōsaka dishes. It doesn’t matter if you prefer restaurants or street market stalls, THIS is the place to eat! Dōtonburi is also a feast for the eyes. The canal that winds through the main hub is lined with the the most amazing collection of neon signs! 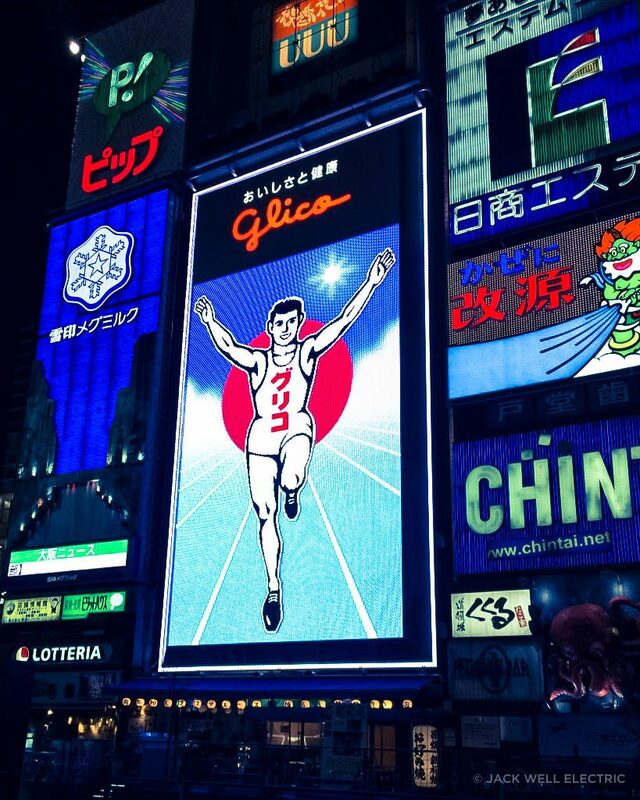 The Glico Man sign is by far my favourite! So for obvious reasons, make sure you visit at night because this place isn’t as dramatic during the day. First stop in Dōtonburi was a little teppanyaki bar on the canal where we decided to get some “cook it yourself” style okonomiyaki. We went with the most basic option; shredded cabbage mixed with batter and topped with okonomiyaki sauce (almost like a BBQ sauce), mayonnaise, seaweed and dried fish flakes. There are plenty of other fillings to choose from including prawns, squid, octopus and much more. 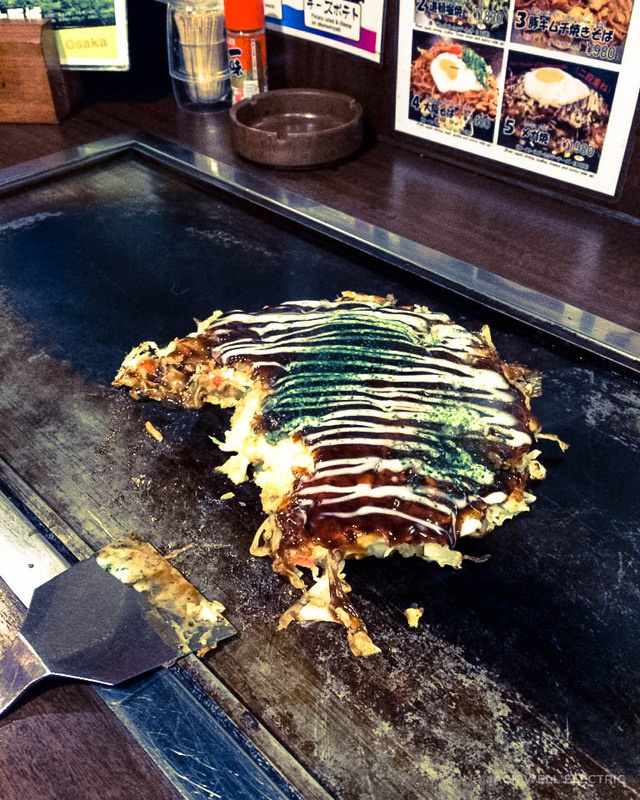 Even though okonomiyaki is a quintessential street food, cooking it ourselves on a hotplate was really fun! 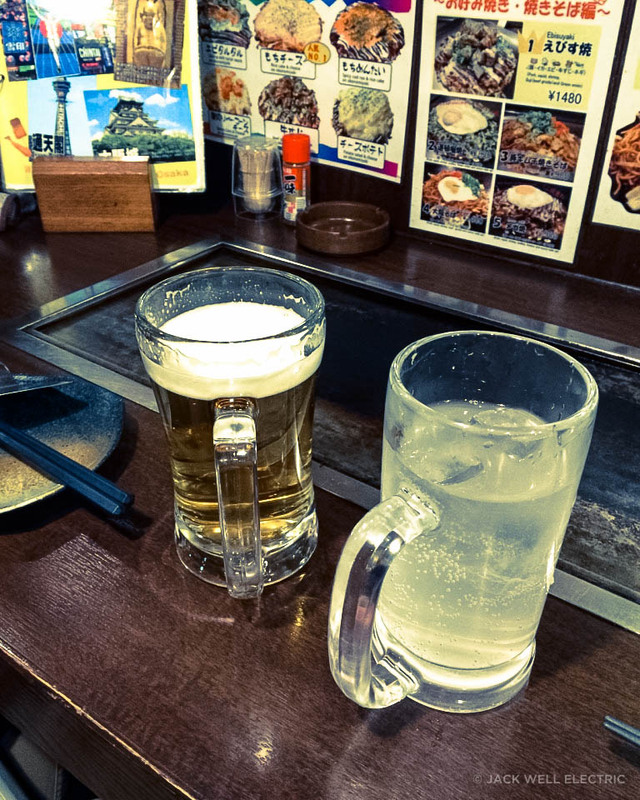 We complimented our meal with some classic Japanese beverages; Kirin beer and Chu-Hi. Chu-Hi is a popular drink that is a potent mix of shōchū, carbonated water and pretty much any flavour you can think of! I say potent because when I lived in Japan, my friends and I used to call it the memory eraser. Try it! I promise it’s good! After our meal, we headed back out into the cold and explored the canal and winding backstreets filled with hundreds of street vendors. 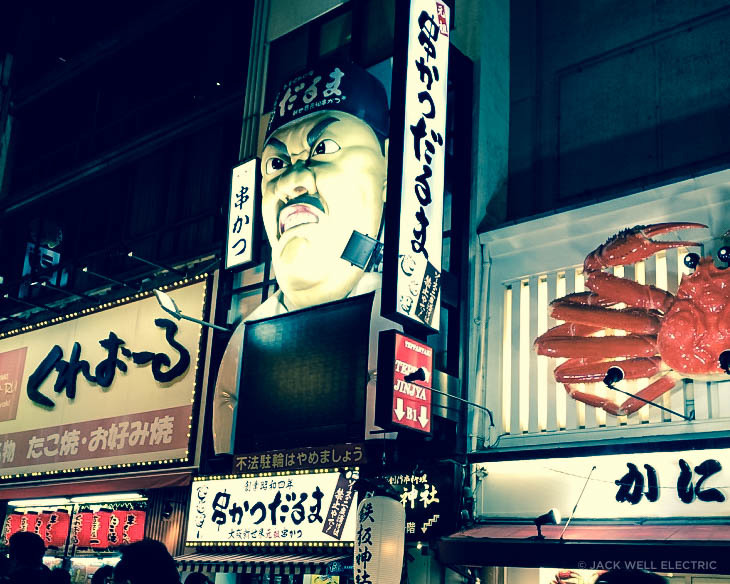 This is where you will find iconic Ōsaka landmarks like the Kani Dōraku mechanical crab and the Zubora-ya blowfish lantern. Weird and wonderful backstreets of Dōtonburi. Before calling it a night we decided on a whim to try takoyaki. We weren’t 100% sure we would like it, but seeing as both of us had never tried it before, we thought why not! When in Rome! 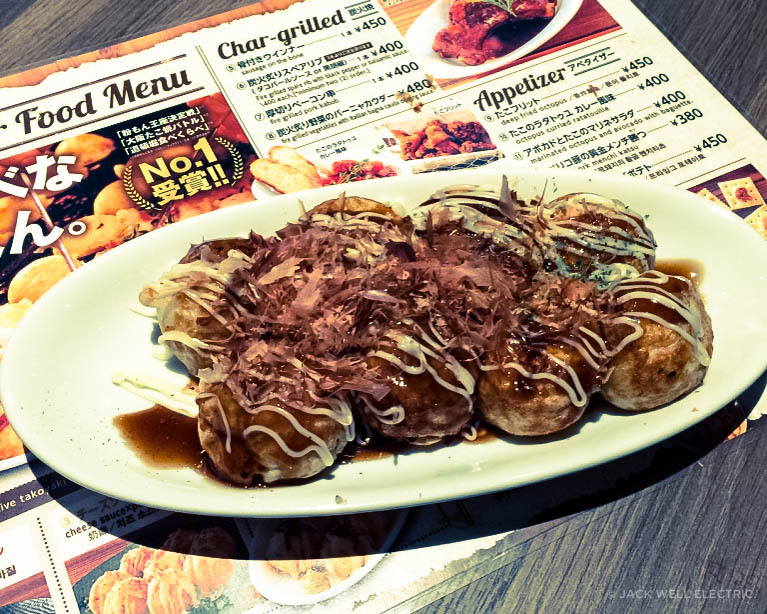 Takoyaki are small fried balls of octopus, pickled ginger and green onions topped with takoyaki sauce, mayonnaise, seaweed and dried fish flakes. We planned on ordering 2 takoyaki balls (one each), but Liam somehow ended up ordering 8!?! I had one and instantly knew it wasn’t for me, so Liam was left to finish off the other 7. The struggle was real. 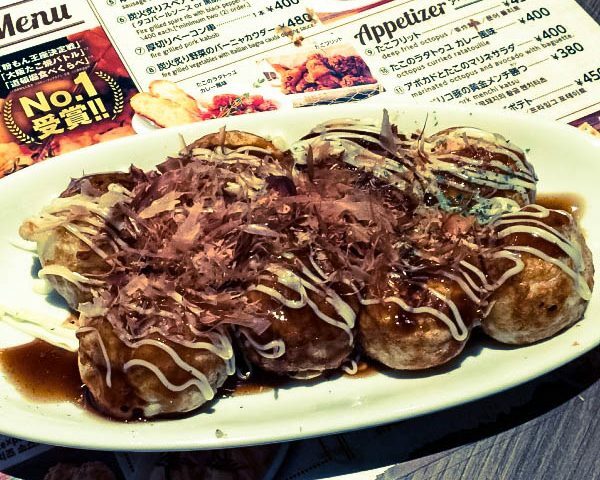 I don’t know if it was the distinct ocean-y flavour, the gooey dough or the weird, hard texture of the tentacles, but Takoyaki is definitely not for us. But it was worth stopping to see how takoyaki is made. The chefs pour the batter into special takoyaki pans and quickly flip the little balls using (what looks like) toothpicks. It is truly mesmerising. Tip: After eating and wandering around Dōtonburi, make sure you check out the shopping in the surrounding areas of Shinsaibashi, Nipponbashi and Namba. Most retail shops stay open until 10pm every night. From Umeda (M16) take the Midōsuji Line bound for Namba and get off at Namba (M20). Take exit 14 out of Namba station and walk straight along Midōsuji St until you reach the Dōtonburi river (about a 5 minute walk). The main hub will be on your right. From JR Ōsaka take the Loop Line to JR Tennōji and transfer to the Yamatoji Line bound for Namba and get off at JR Namba. Take the north exit out of JR Namba station, turn right along Sennichimae St then turn left when you reach Midōsuji St and follow it until you reach the Dōtonburi river (about a 10 minute walk). The main hub will be on your right.